Last week I once again found myself being an incredibly proud mummy. 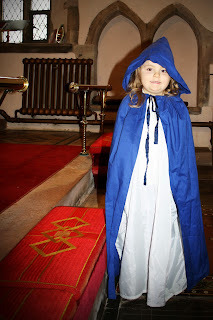 Out of the whole of Ruby's school, Ruby was asked to play the part of Mary in her school nativity. I can't tell you how proud I am, especially as I never expected Ruby to have a nativity at her age let alone for her to be selected out of the whole school. I really don't think Ruby knew how big an achievement this was and she took it all within her stride. Ruby looked so angelic in her outfit and I very nearly cried as I got my first glance of her dressed up.